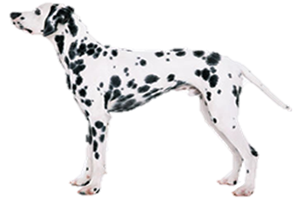 The Dalmatian is one of the most recognized of all breeds due to their distinctive spotted coat. They are the English Coach Dog or Carriage Dog, the only breed that traditionally alongside horse-drawn vehicles. Their affinity for horses and instinct for this task is so ingrained that an adolescent will fall in behind a carriage with no training. Early dogs had their ears cropped away and were fitted with studded collars, giving them a fierce look as their main duty was protection of its people and their goods. Later, their presence became more a status symbol as they remained trotting alongside their charges. When the breed arrived in the United States it became intertwined with horse-drawn fire wagons. To this day they are often kept at stations as mascots even though the horses were long ago replaced by motorized engines. In contrast to the Dalmatian’s notoriety they have one of the murkiest ancestries. The Fédération Cynologique Internationale (FCI) lists its country of origin as Croatia (containing most of modern day Dalmatia). However, you should not be confused by this breed’s name. Spotted dogs such as these have existed since antiquity in Europe, Asia, and Africa. Similar dogs are found on Egyptian bas-reliefs running behind chariots, on 4,000 year old Greek friezes of hunting dogs, and a fresco in an Italian chapel dating back to 1360. The French naturalist Buffon called these dogs ‘le Braque de Bengale’ in the mid-1700s and the Harrier Bengal in 1790. This has led some to suggest the breed originated from India, but no explanation was given for either name. Their modern name was coined in 1791 by Thomas Bewick although most sources state they were not present in Dalmatia at that time. Some have suggested that the name may refer to a connection with the Roman church as a dalmatic is a vestment worn by deacons and bishops. A probable theory is that the first dogs resulted from a mutation in any of the European scenthound lines (they have a ‘pointer’ look) and spread from there. Their coat would have made for a high demand, even in the earliest of times. The only undisputed fact regarding their origin is that the breed became refined in England. Is the Dalmatian Right for You?